We are hiking the Camino de Santiago, enjoy this recipe while we walk our butts off. Thai has a special place in Carmen and my kitchen. The food is spicy, sour and sweet; these are flavors that we just can’t get enough of. Last year I took a four week Thai cooking course and this was one of my favorite recipes. The instructor was Kasma Loha-unchit who teaches more courses and dishes than you will ever have time to fully take. I like this one because it was easy enough for me to make on a weeknight, but with flavors that made me excited to have leftovers for several days afterwards. This dish really cannot be successful without fish sauce. The aroma and salty savory qualities from fish sauce really bring out the flavors of the garlic noodles. Charsiew is very common in the Bay Area and can be found at most Chinese grocery stores. In hangs in big dripping slabs that have been roasted and glazed in a red sweet sauce. A highly flavorful roasted chicken or tofu could be used. The Tianjin vegetables are a very salty and pungent cabbage stored in a clay pot. We had been using these for Sichuan cuisine and found them in SF Chinatown. You may need more fish sauce if you choose to omit these. Fresno peppers are a red jalapeño. I sometimes substitute fresh baby spinach for the romaine. 1) One hour ahead. Bring a pot of heavily salted water to boil and cook the noodles until soft, but not mushy. 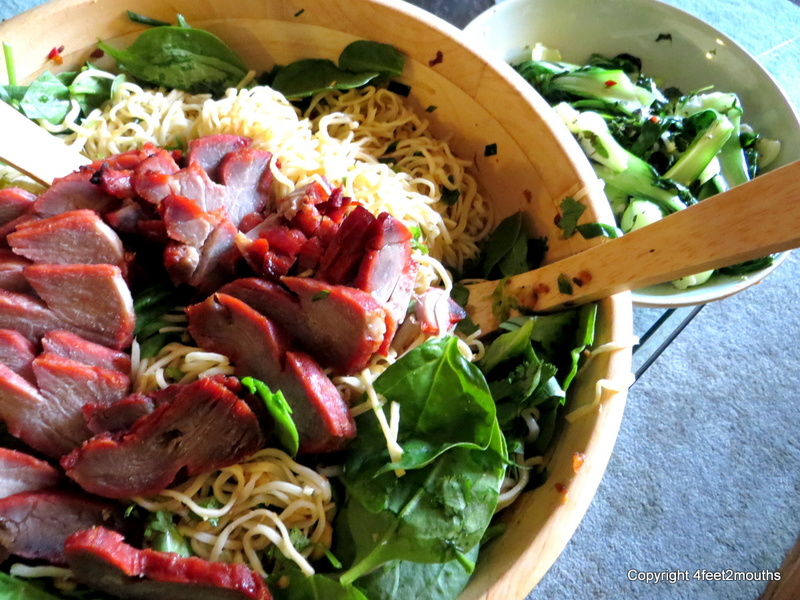 When cooked remove noodles from pot, drain and set into extra-large bowl. In a steel wok or cast-iron skillet heat the oil until almost smoking. Add the garlic and stir until almost fully golden. 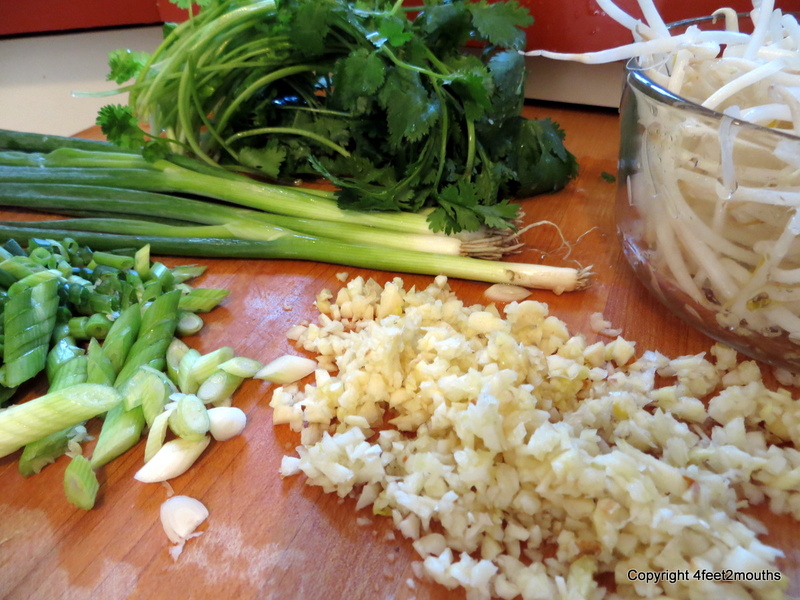 In the last 30 seconds add the white parts of the green onion. 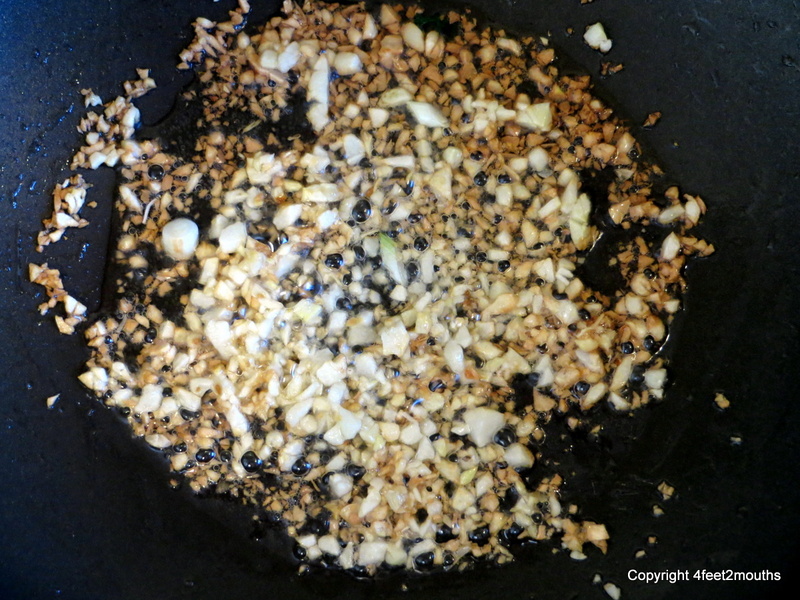 Pour the garlic, oil and onion remnants into a heat-proof bowl and set aside. 2) 45 minutes ahead. 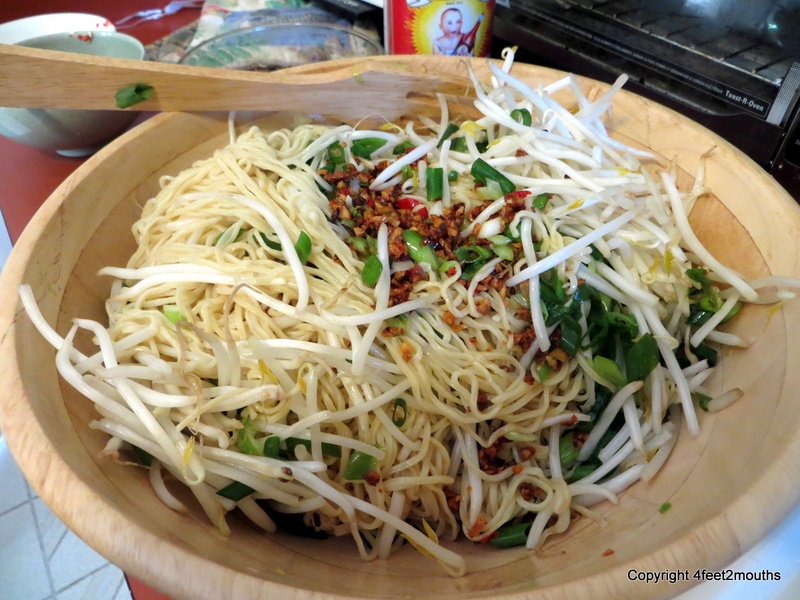 Mix garlic, oil, Tianjin vegetables, peanuts, chili peppers, green onions and bean sprouts into noodles. Douse the noodles with about 1 Tbs. of fish sauce and 2 tsp. of sugar and toss again thoroughly. 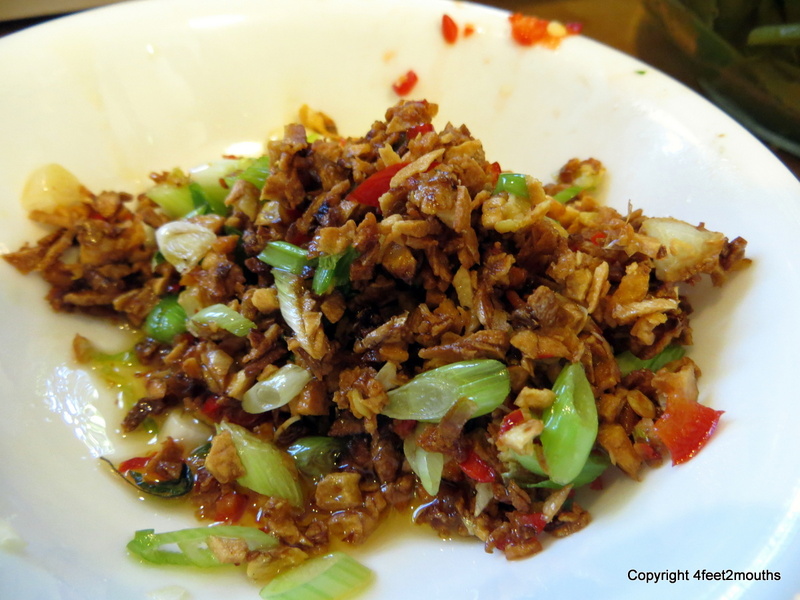 Taste it, the noodles need to be salty enough to taste the garlic and sweet enough deliver the spicy peppers. Add more fish sauce and squeeze in 1/2 of a lime, toss again. 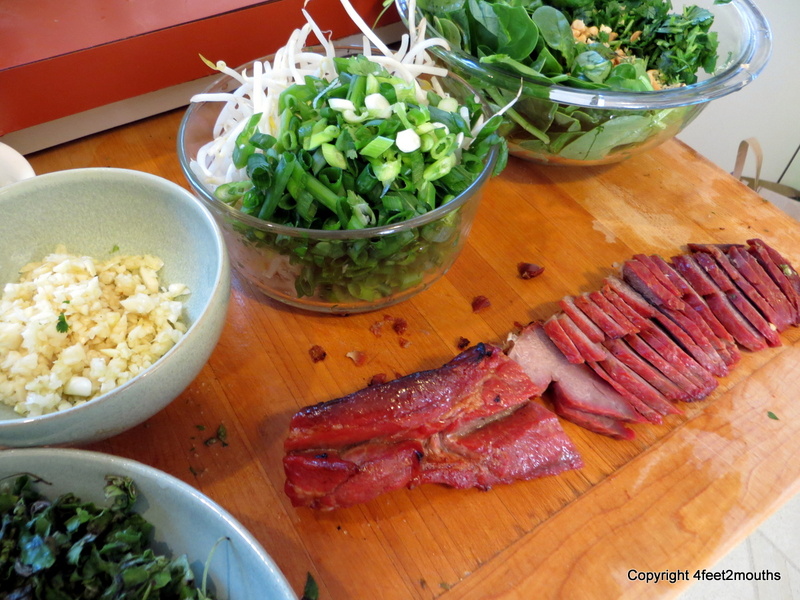 Continue to alternate tasting and adding fish sauce, sugar and lime until the balanced. Let sit for a couple minutes, toss and taste again. 3) 15 minutes ahead. Fold in the romaine lettuce and cilantro. Lay the charsiew over the top. Place a few sprigs of cilantro around the edges. 4) Serve. I typically eat these noodles tepid or just slightly warm. 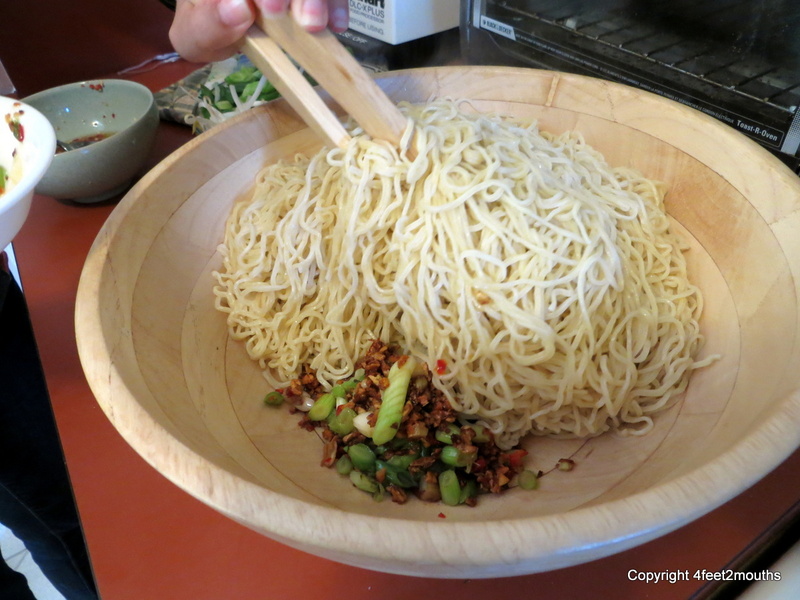 Place a heaping mound of noodles on a plate. Pick out a few pieces of barbecued pork to lay over them. Sprinkle with additional peanuts and ground chili peppers. 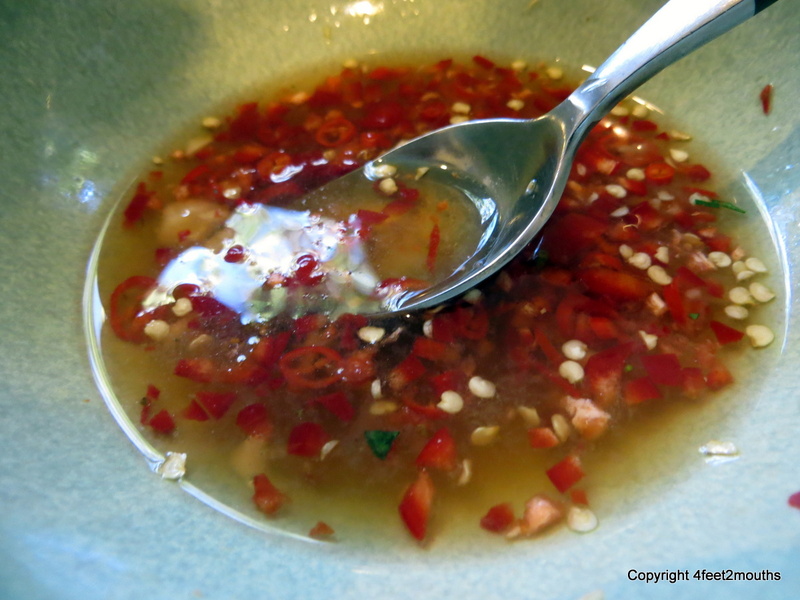 Additional fish sauce or vinegar with chilies can also be added to bring out an immediate freshness to the dish. Serve second, thirds and walk away stuffed. It will work without fish sauce, I will prove it!! !